Whether you need a Fortnite birthday party game or just a way to keep your Fortnite-loving kids occupied when the wifi is down, this printable Fortnite activity is the perfect solution. Wondering if Fortnite is bad for kids? Read my Parents Review of Fortnite. Printable Fortnite Bingo Cards (available below) – I recommend printing these on card stock or laminating for multiple uses. Printable Fortnite Bingo Drawing Pieces (in the file below) – Again, printing these on card stock makes it easier to use them again and again. Bingo markers – We used flat marbles but buttons, pennies, dry erase markers (on laminated boards), or whatever you have will work. Each player needs one Fortnite Bingo card. Put all the drawing pieces in a container. You can designate a person to pull the drawing pieces or take turns. We like to pass the bowl and let each person pull a piece without looking. If the players have the item pulled, they should cover the icon on their card with a bingo marker. In traditional bingo, the first person to fill all the spaces across, down, or diagonally must shout “BINGO!” to win. Our boys made their own rule that if a dance was drawn, you had to get up and demonstrate. Oh the laughter!!! And I encourage you to let your kids make their own rules. It’s so much fun to see what they can create. Emote dances only – Dance party! The first person to cover all the dancing emotes wins the BINGO. Emote spray paint only – Show some emotion. Cover all the spray paint logos to win. One thing to note… My family and I tried to play a total card version and were surprised when we each finished our total card at the same time. This is probably the result of not having enough variety in the clip art pieces to make more card combinations. I can not find the link for the fortnite bingo anywhere. Please help! 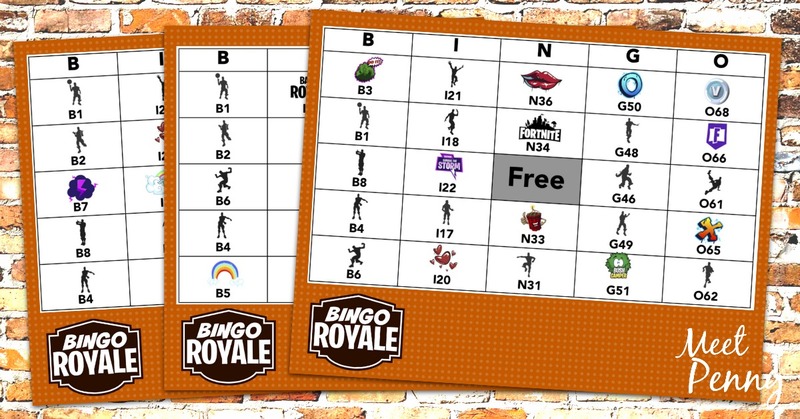 Where is the link to print the fort nite bingo cards! I’m going nuts looking for it! Please tell me how I can get the bingo game! I subscribed but never got an email. HELP! How do I get the free bingo prjntable?? Help?? Yes! Where is the Free Fortnite Bingo? I dont see the link to print it out…Please HELP! or does it not exist? So, not sure HOW to play the bingo I received? the icons don’t match the ones on the boards and the numbers don’t either. Maybe it’s a version I’m not familiar with? I just expect the number and/or the icon to match the cards. What am I missing?